I have been staring at this Vicente Romo card for over an hour and I still don’t know where to start. With his giant head? With his puzzling pose, which seems to suggest any number of scenarios such as that he’s playing air piano or putting a hex on the opposition or leeringly blocking a ball girl from exiting the field? 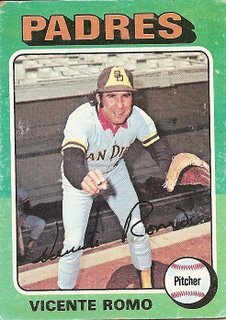 With the fact that by the time this card made its way to my 7-year-old hands in East Randolph, Vermont, Vicente Romo had already been released from the San Diego Padres? The release is puzzling, due to the fact that Romo had been a fairly effective relief pitcher for some time–as the back of the card puts it in the customary caveman syntax of baseball card text, Romo was “one of club’s top firemen.” I guess the lesson here is that no one really knows what’s going to happen from one day to the next. One minute you could be horsing around during one in a seemingly endless succession of yearly Topps photo shoots, and the next minute you could be packing up your locker. When Romo was released, he had a perfectly even won-loss record of 31 and 31. He wasn’t that great, but he wasn’t that bad either. He had just completed a season in which he had gone 5 and 5, proving that he had mastered this kind of reliable albeit somewhat dubious consistency. But is there not a place for us Vicente Romo types who maybe don’t continuously find innovative ways to widen the profit streams of our employers a hundredfold but who also don’t accidentally burn company headquarters down after a negligently concluded cigarette break? Well, apparently not. Romo did not latch on with another major league club in 1975. Perhaps word had gotten around that his best days were behind him. After all, he was 31 years old (a year for each win and for each loss), no longer young enough to be counted among the developing guys who might suddenly blossom into something better than what they were. He did not play in the majors in 1976, either, or in 1977, 1978, 1979, 1980, or in the strike-marred season of 1981. But in 1982 Vicente Romo returned. The incredible, improbable comeback of a man who had been out of the majors for exactly as long as he’d been in the majors was only slightly overshadowed by the fact that Romo finished the season with a 1 and 2 record. He vanished from whence he came when the season ended, and did not reappear on a major league roster in the next year, or the one after that, or the one after that, or ever. But even to this day there are those of us who believe that Vicente Romo will return once again to even his record and to prove that anything that is gone can return. In my faded memory, then White-Sock Ed Hermann was forever cursed to be always just a smidgen slower than his Minnesota doppelganger and counterpart Glenn Borgmann in that eternal competition between burly, mustachioed, second-string American League West catchers whose names ended in matching double consonants…. Perhaps he’ll turn up, poignantly, as a bench coach for the Atlantic City Surf of the lowly, independent Can-Am leauge. And be somehow pressed into action one particularly grey and stormy late September afternoon…. Perhaps even more intriguing than his 1982 comeback is the fact that his nickname was “Huevo”. I wonder if you can go into any restaurant in Santa Rosalia and order the “Huevo Romo”. It’s been said, “everyone needs a hobby.” I have one… his name is Scott Bailes. I met Scott at Cleveland indians Fantasy Camp in January of 2007. He and Doc Edwards were my coaches in this my rookie campaign. Over the years I have tried to maintain contact ( often daily… sometimes hourly). Those who know me have said that Scott is not my hobby so much my mancrush. I vastly prefer the term bromance as it implies that the feeling is mutual. I know Scott does too. Seemingly anything can remind me of Bailes; Ketchup (he puts it on chicken sandwiches), Ducks (he walks like one), garishly effeminate athletic shoes (he’s got a closet full), Kickboxing (he is very good — and I’ve got photos of my bruised chest on my phone to prove it). You see, I had been under the mistaken impression that Scott’s non-military service, non-injury related absence from baseball, four years between his retirement from the Angels after the 1992 season and his return with Texas in 1997, was the longest such absence ever. The long layoffs and eventual returns are not the only similarities between these two mediocre pitchers. Both wore chief wahoo (Bailes from 1986 through 1989, Romo in 1968 and 1969). And, in a case of pure coincidental magic, both men dominated Hall of Fame Baltimore Orioles. Vincente Romo faced Brooks Robinson 18 times, holding him to a .071 BA (1/14). Scott Bailes faced Cal Ripken Jr. 24 times, holding the iron man to a .053 (1/19). Josh Wilkers writes, “But even to this day some part of me continues to believe that Vincente Romo will return once again… and prove that anything that’s gone might someday return.” It seems possible that Romo returned in the guise of Scott Bailes. I know, I really should get a hobby. It has occurred to me since I posted that there is most likely a significant difference between Bailes’ 4 years away from MLB and Romo’s 7 year absence. I expect that since Romo was released by the Padres in 1975, he probably hooked up with a minor league club or DR or Venezuelan club. He most surely was not out of professional ball for all of those seven years. In Bailes’ case, he left the Angels after the 1992 season healthy and of his own volition. He played no professional ball after that point, but was seen by a Rangers scout hurling for a local Springfield, MO amateur team in a tournament in the Lone Star State. This scout had Scott at 90+ mph on the radar gun and extended an invitation to the Rangers upcoming spring training. After talking it over with his wife and daughters, he decided to give it a shot. Wise decision, as he earned $360,000 over those last years. Maybe Scott Bailes does hold the record for the longest time between MLB appearances (non-military service or injury related and with NO pro ball appearances in between). I know one thing, I should get a hobby. … and it has just been pointed out to me that there is only one “N” in VICENTE. Lo siento Vicente, wherever you are. romo was in the mexican league where he was a pretty big star, mostly as a starter.